Amid an on-going massive police crackdown on unfit vehicles, especially passenger buses, the owners have allegedly created an artificial crisis in a bid to force the government to stop the police action. This move by the owners has put the commuters into great sufferings. Police said drivers of many unfit and authorized vehicles including passenger buses did not operate as usual fearing seizure during the on-going special police-week. “Due to such police drive, many transport owners and workers’ leaders also kept their buses off on the roads creating artificial transport crisis to create pressure on the authorities,” an insider told the Daily Sun. Vehicle owners and transport leaders allegedly want to jeopardise the police crackdown to put their defective vehicles back on the strrets. He said adding the government shukld become a captive to these grouops, but act. 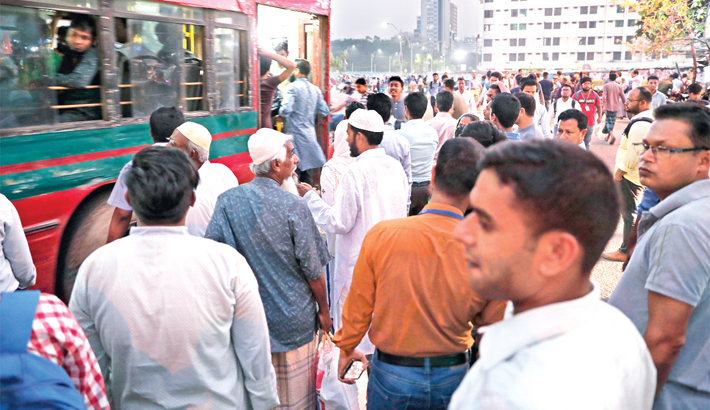 On Sunday, it was found that a large number of people helplessly waiting waiting at different city-intersection and crossings including Maniknagar Biswa road, Motijheel Shapla Square, Malibagh, Mouchak, Badda, Gulshan, Mirpur, Shyamoli for transports. Abdul Khaleq, a resident of Dhalpur area alleged that he along with his wife had been waiting at Golapbagh Biswa road for about an hour for a transport. Only a handful of passenger buses are now plying on this route with excessive passengers. I along with my wife hardly tried to get into a bus but failed. Due to traffic police drives, most of the passenger buses did not operate, a bus driver said, adding that “We kept our buses off on the roads as the traffic sergeants at various points are seizing the unfit vehicles’. A good number of passenger buses were also seen being seized on different city-roads including ManikMia avenue, Badda and Farmgate areas on Sunday noon. Simultaneously, most of the passenger buses were also seen plying on different city-streets with over-crowded. Many commuters are paying double or triple fares on auto-rickshaws as drivers take advantage of the situation. But even then many commuters have been unable to find transport as demand outstrips the number of auto-rickshaws. Police sources said that as per the strict direction by the DMP commissioner Asaduzzaman Miah the traffic police are now on hard-line against unfit and unauthorized vehicles in the capital to return discipline on streets. As per our boss’ instruction after the recent fartal road accident in the capital’s Bashundhara road where a university student killed, we all police sergeants and police constables went for massive checking against the unfit and unauthorized vehicles plying on the city-street, a traffic sergeant said. Just two days ago, the DMP commissioner strongly vowed that no any unfit and unauthorized vehicles would be allowed on the city-street. At the same time, he strongly instructed all traffic departments to go for legal action to return discipline on the streets. Asaduzzaman said police, Bangladesh Road Transport Authority (BRTA), and other organisations related to traffic management system have failed to bring discipline to the roads and cannot shrug off responsibility. “When an accident takes place in a safe zone, it is not possible to give answers … So time has come to bring discipline to the transport sector,” he noted. Blaming the contract-basis appointment of drivers for most of the accidents, the DMP commissioner said the deaths of Abrar and two students of Shaheed Ramiz Uddin Cantonment School last year are in no way acceptable. When a driver is appointed on a contract basis, he often stops his vehicle in the middle of the road to take passengers, blocking the path of other vehicles, he said. “This tendency of earning more is one of the main reasons for road accidents,” he mentioned. As part of their move, traffic police including police sergeants have launched massive checking for the unfit and unauthorized vehicles on different city-street. Traffic constables and sergeants were seen stopping and checking many motor vehicles including passenger buses and motorbikes at different strategic points in the capital on Sunday. According to the DMP, legal action has been taken against over 400 passenger buses plying on different city-street on Sunday on charges of violating traffic rules. The DMP also went for legal action against a total of 48308 vehicles for violating traffic rules in the capital during the last one week. At the same time, 301 motor vehicles have been dumped and wreckers were called for 5725 other vehicles. Students of different schools, colleges and universities took to the streets on Tuesday after a bus accident on Dhaka’s Bashundhara area that left one university student dead. There have been widespread allegations that despite having no fitness certificates and route permits, a large number of buses are running on the city streets by bribing a section of traffic sergeants. A portion of the bribe, given by bus owners on a monthly basis, goes to a section of police high-ups and some political leaders, several police officials, who had worked in the traffic division in the past. Sirajul Islam, the driver of the Suprobhat Paribahan bus that killed Abrar in Bashundhara area on Tuesday, was driving recklessly to flee after hitting another pedestrian in Shahjadpur area. Sirajul is now on a seven-day remand. Abrar’s death sparked a firestorm of protest among the students. The situation calmed down after the authorities suspended operation of all buses belonging to Suprobhat and Jabal-e-Noor, and assured students of visible steps for safe road by a week. Meanwhile, students blocked Dhaka-Mymensingh-Tangail highway at Gazipur intersection on Sunday morning demanding safer roads and protesting the killing of two college students in a road crash on Saturday.